Rosabella and Ginger, which were bough at the store, for a third of their original price. 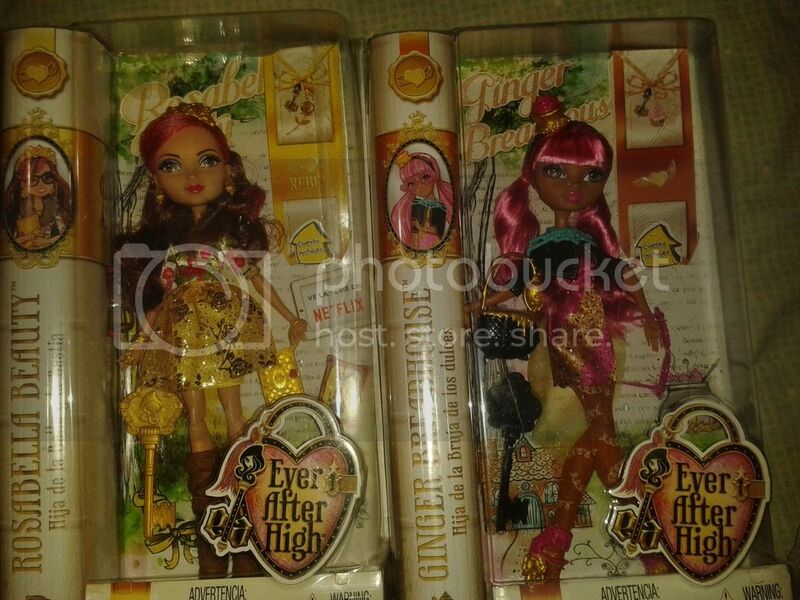 They had *lots* of gingers, but that was the only Rosabella.. and a couple of Cedars, but I already had her. 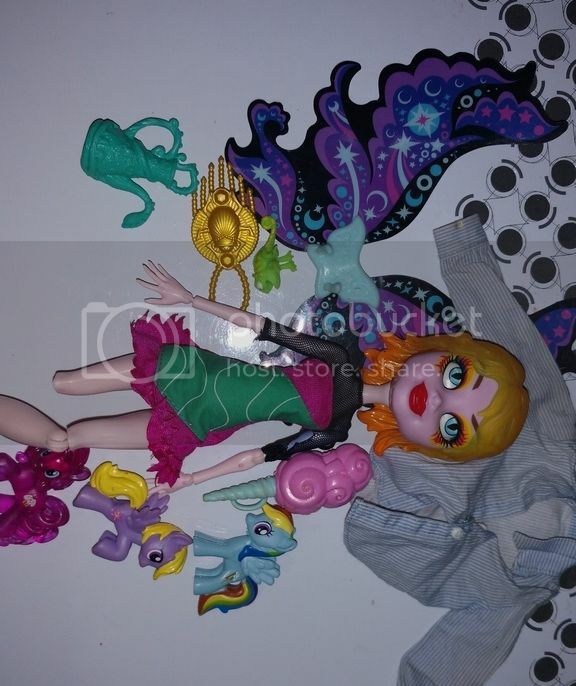 Handless Gil, Random Barbie Junior(Which I bought because she's wearing Art Class Draculaura dress and I *love* that thing, Raven Fakie, Lugia and Rayquaza, a complete MH stand (They're usually only one or two pieces), Butterfly wings Rarity, Unicorn Pinkie Pie(? ), Beast(!!!!!) random baby penguins and random stuff. (I love the food tray) aaaaaaaaaaaaaaand a randomly found Hello Kitty Club girl! That Hello Kitty Club doll is cute! I googled her and I think you're right! Her cutie mark is 3 blue stars, os pretty sure she is Twinkle. I felt sorry for Frankie and got her. 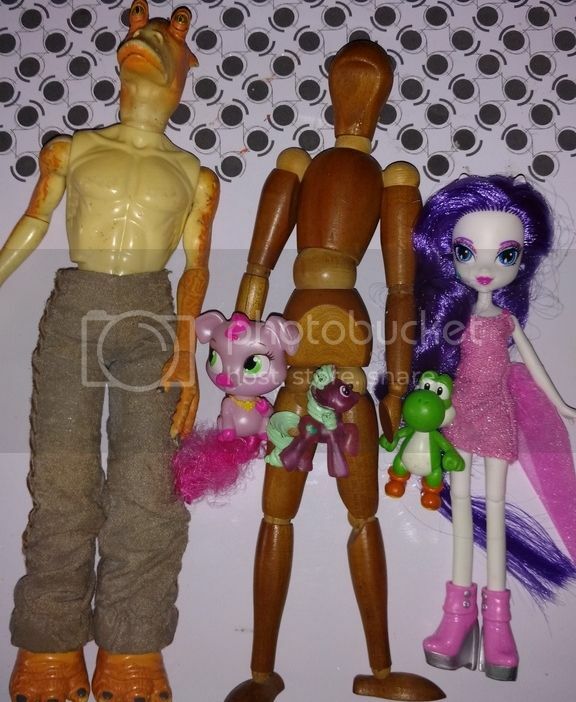 Plus, she has a hand and he clothes. 10 pesos. Another Troll girl! I tried doing a head swap with the Hello Kitty doll and the knob on Kitty is still bigger than this one, plus the fact that the troll head is much harder, making it difficult to re-head her. Rarity! The only core 6 Equestria Girl I was missing. Her hair is awful, and I hope her face can be cleaned, but hey, articulation! I knew he had a rainbow power blind bag sized figure, but didn't know he had other merhandise as well, as a Doctor Who AND MLP:FIM fan, I find his fanon character awesome(And his "Slice of Life" characterization hilarious). EAH gold stand, which I think belonged to Apple, 'cuz I got her sig. 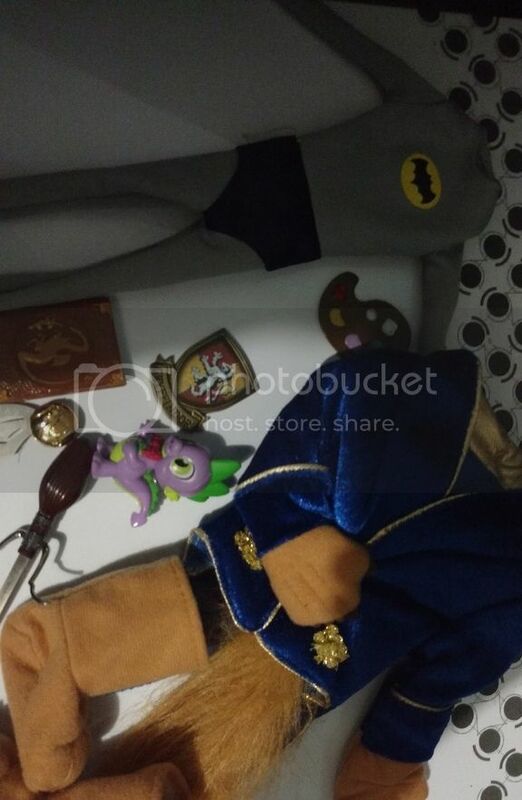 Headband and purse too, random wings(I think they're pony POP), Pascal pillow, random box(I think it's also from Rapunzel), Twilight Sparkle belt(I think! 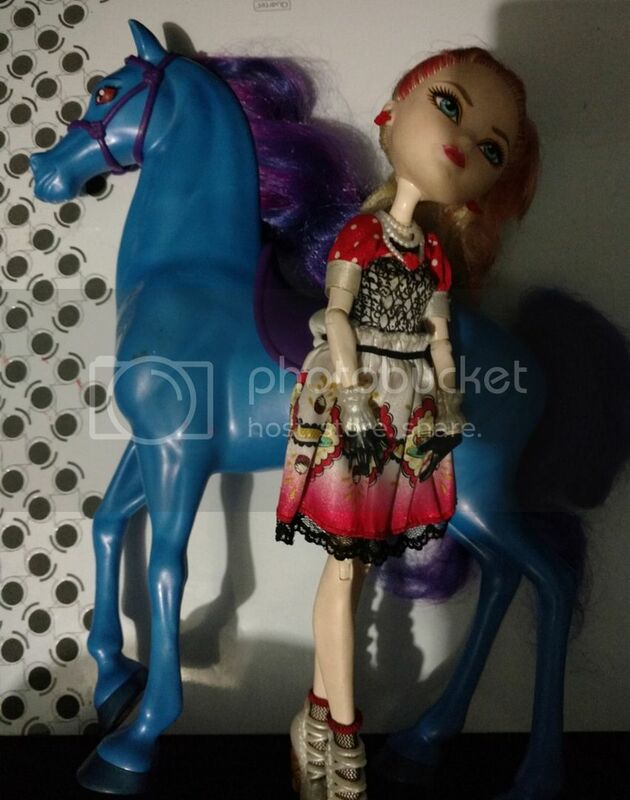 ), Lalaloopsy doll(I think) a pink squirrel(From the MLP brushables? ), and two random pets. 40 pesos all. After some googling, I realized that the bunny from last time and the red ... cat? dog? fox? thing from this one looked too similar to be a coincidence, and after some light googling discovered they are actually suposed to be pets of the disney princesses(Of which they have a gazillion each). 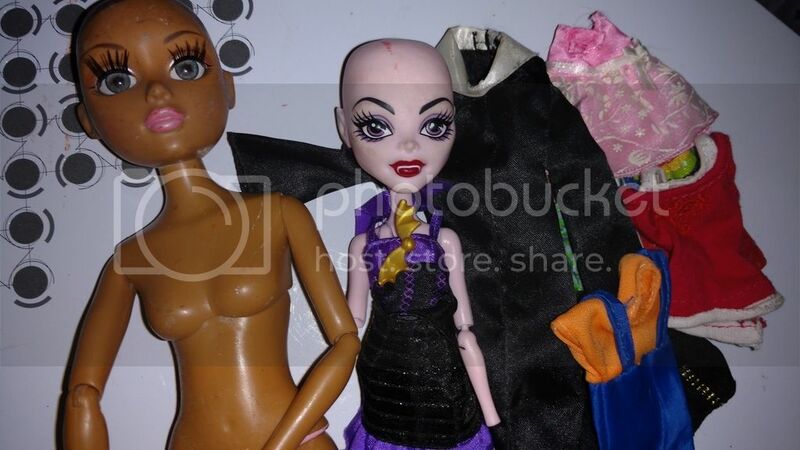 Ironically, I think they fit better with EAH aesthetics than with the actual princess dolls. Congrats! That's quite a haul! Totally surprised to have him. He was kind of on the expensive side, but totally worth it. 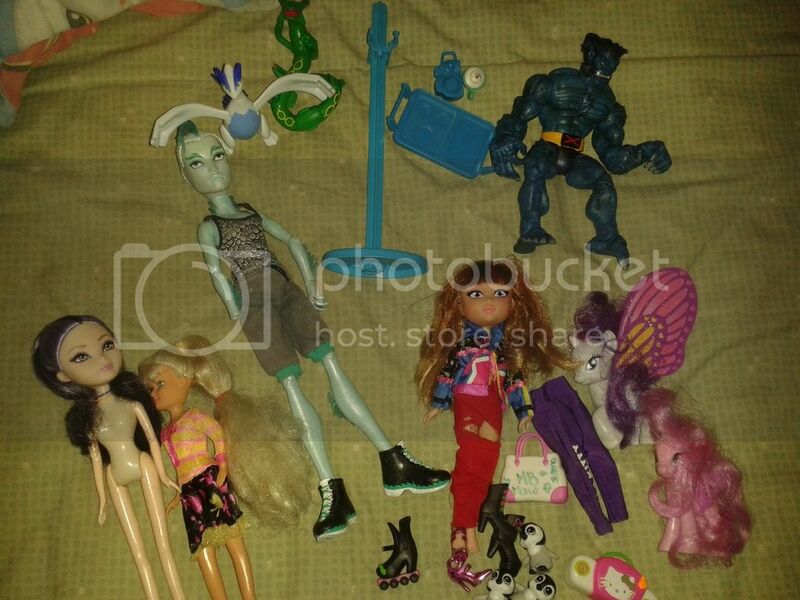 Lyra Heartstring, a random Lalaloopsy, Jake the dog( ), random unicorno(I have now 3! ). TBH I never intended to get her, as I dislike her "helmet" haircut and most pictures I have seen of her have her very very wall-eyed(No offense) but saw her complete -I think- and I couldn't resist her charms. She kind of reminds me of Elsa from Frozen. Her hair was sticky and a mess, with what I hope was hair product and is the first doll I have to actually wash before use. It's all silky and easy to comb now. These days, I'm loving the Monster High dolls more, but I think that if I could've found a really good-looking, non-wall-eyed Bunny Blanc, I'd have gotten her, 'cause I find all things "Alice in Wonderland" to be fascinating, and, of course, they make me feel..."curiouser and curiouser...". 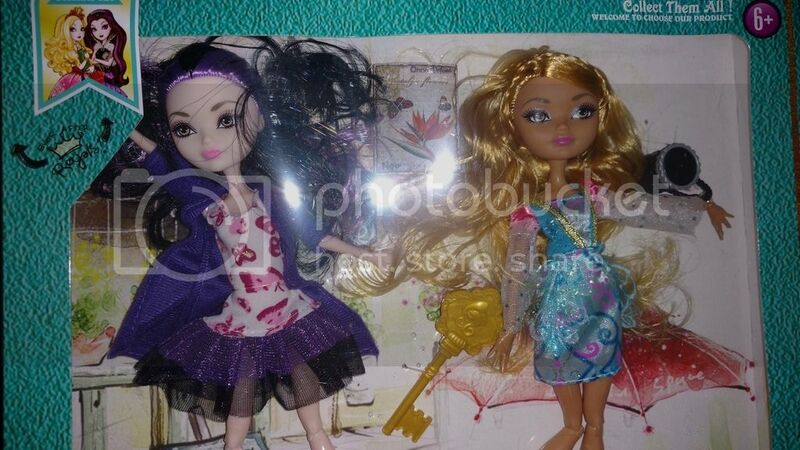 Well, in the Fakies thread I mentioned I had bought a two-pack fakie of Ashlynn and Raven, so here are more pictures! Baymax(YAY! ), Funko Snape(DOUBLE YAY! ), Mickey mouse shirt(For Neighthan, obviously) Random LEgo guy and Jane! She has her pants under the skirt, but hey, more clothes, I'm not complaining! Elle has a Frankie arm/hand and is missing her other arm... 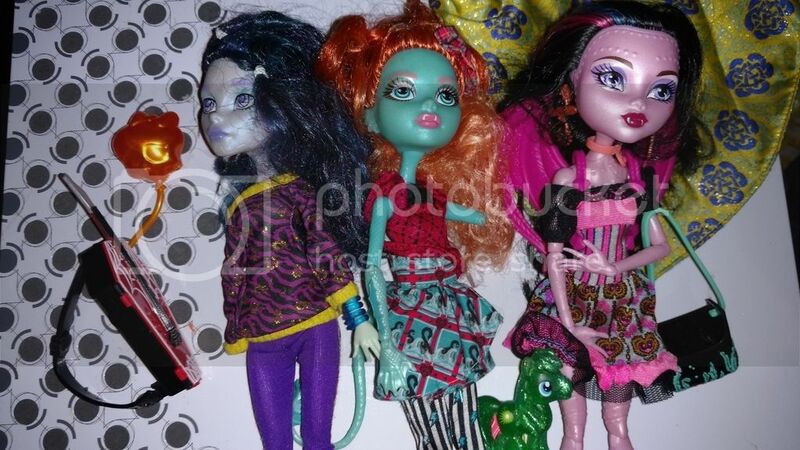 I will replace them with either Ghoulia's, or paint some Robecca ones. I kinda like how she looks in those clothes. Lorna is missing her arm/hand and for some reason is wearing Frankie's pants(again, not complaining). Them and Jane are all barefoot, and I got from the same person. Also, that guitar-purse and the balloon. Dracubecca only has her dress and earrings, and is wearing one of the cats boots. The pony is awesome. A Moxie teen(no idea who she is) and parts of the vampire cam(She's missing her lower legs, both hands and an arm, but hey, a torso!) . Also a bunch of clothes. 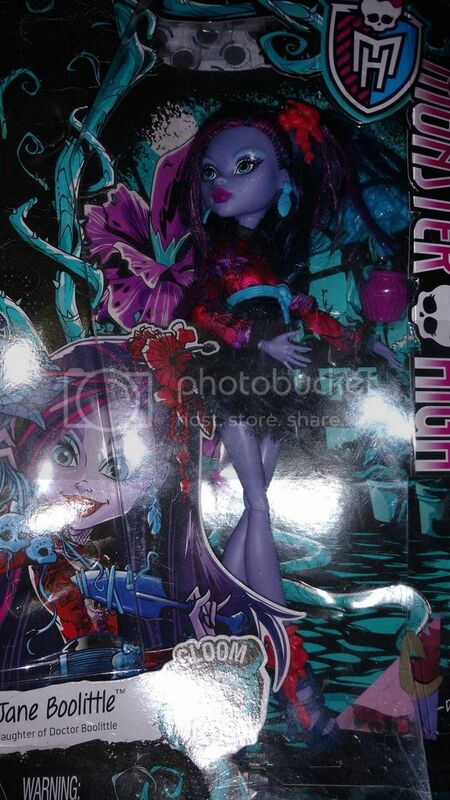 After not having any Jane before, I got the sig one(sans shoes) and now I found her Gloom & Bloom release! I hope that that same Jane Boolittle is still at the Big Kmart that's near me, 'cause she really is pretty! A... manequin? I have no idea how they call those, but it's a wooden doll that holds poses, for drawing. He's also a good size for either MH or EAH. Another articulated Rarity, in much better conditions than the other one. The other one head's is kind of yellowing, so either I rehair her to do a custom, or use her body for Celestia or DJ P0n3. A Pig from Palace Pets. She's adorable and will become the pet of one of my EAHs. Also a Yoshi and a blind bag pony. But yesterday, I almost ended up going home walking 'cuz I almost spend the money for the bus fare... SO MUCH GOOD STUFF. 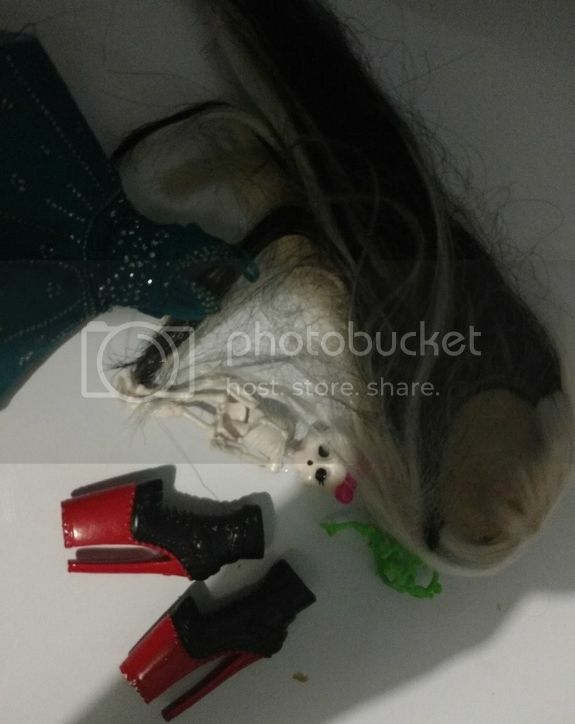 A wig(I think it's Moxie Teenz, 'cuz it has no plastic thingie inside), MH skeleton doll, random dress, random shoes with huuuuge platforms and Venus' vines. 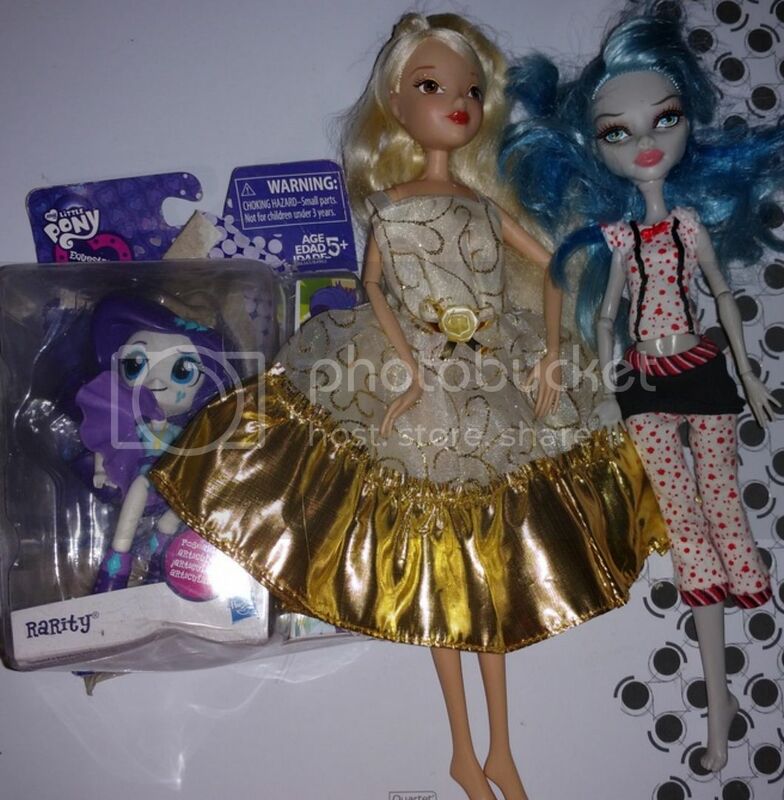 Poppy(With horrible hair :p), Lizzie and Ashlynn, 40 pesos each. They also had others, but I choose the ones I didn't had already and was planning to get more today, but the seller didn't go :/ Twilight Sparkle was 5 pesos, and I bought mainly for the shoes, her hands/arms are completely chewed. Her head is good too. Another Hat-Tastic Apple... minus hat, but I'm kind of surprised she has her earrings, necklace, socks and shoes. And it was actually cheaper than my other one! From the same seller, Nightmare (Moon). 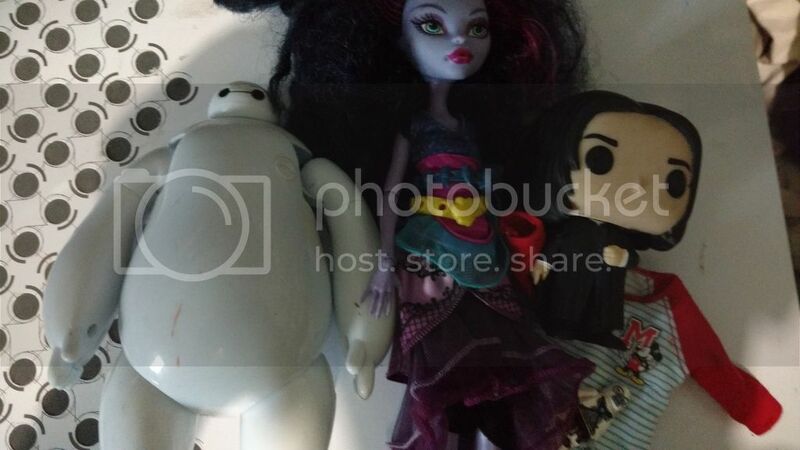 I'm fairly surprised at how big she is(She's bigger than Maximus from Rapunzel). Both were mine for 80 pesos. 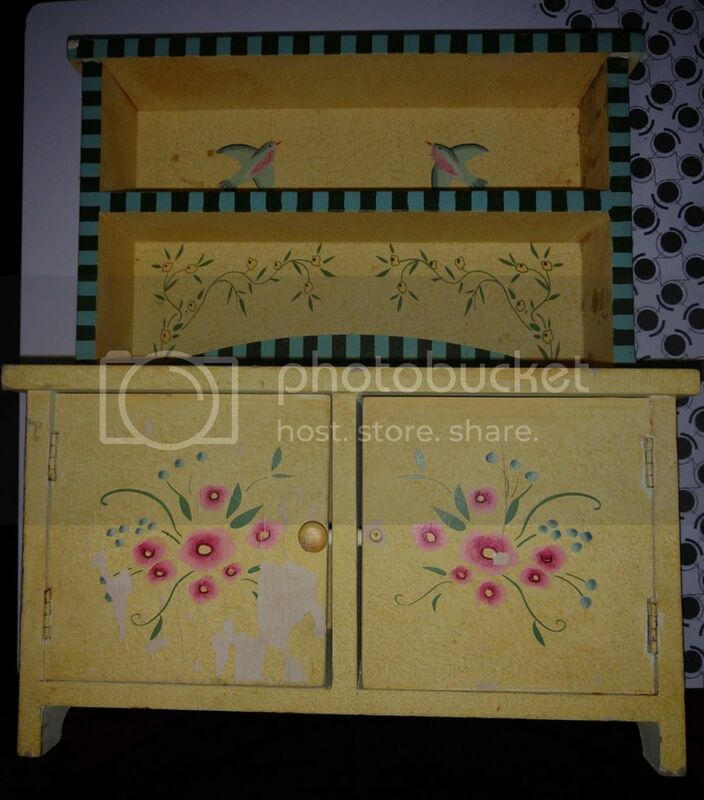 Great finds, that cabinet is lovely! Thanks! It's such a bad thing I have to repaint it... I probably only paint the lower part and leave the rest alone. 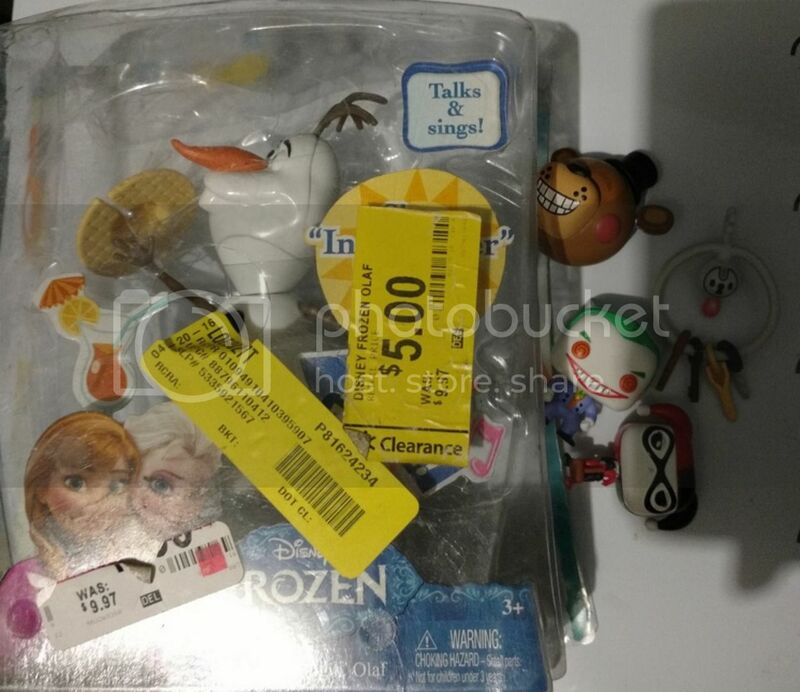 Singing Olaf! I wasn't going to buy him until I pressed the button and he works! Klefki! One of my favorite pokemon. And he's in scale with the dolls, so bonus points for that! Equestria Girls Rarity Mini. She has a broken leg(HOW?) but is complete. I'm gonna superglue that thing and live happily ever after. She's wearing a custom dress that is tooo big for that body. Hope it fits EAH, or i'll gather it a bit, anyway.